wow, I'm installing android sdk because of this. Cool! I am not an android developer, so if you can give a detail guideline how to build the emulator will be great appreciated. nice job!. I'm getting a CRC error while unzipping the downloaded file. any idea? Is it possible to share the valid 1.0 dat file somewhere? never mind. Got it working. Thanks for the dex file fix. I would have spent hours on that. I've gotten to the point where I'm ready to make the system image, but I can't find a working copy of mkyaffs2image anywhere - any pointers? I'm running Leopard. 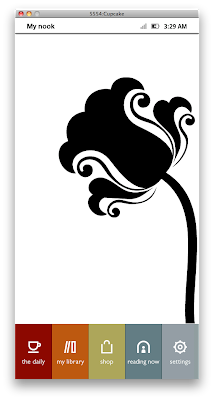 it was "if -lt v0,v1, :cond_483" in the 1.0 version. Might be different in a later version. But I don't know if the later version packages are just an upgrade or has all the files. 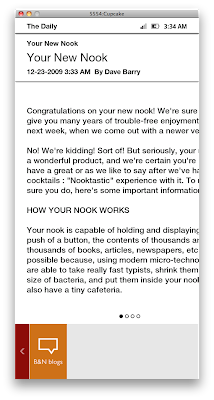 I meant the 1.0 version of the nook software. could you just upload the patched image? There is a more up to date guide at http://nookdevs.com/title=Emulator based on this one. "../yaffs_guts.h:831: error: expected declaration specifiers or '...' before 'loft'"
Can anyone explain - how to use Nook to browse internet to check hotmail, gmail and other sites. I have a new Nook with me. Do not know how to get a browser on this. I am not engineer (you can think me as dumb here!!). Is there any application I can download and install? Or Do I have to open the Nook to overwrite/ add the app?? I get the "A N D R O I D_" screen as well. Anybody figured that out ?